All these are phrases that people say when they are in pain. Approximately 47% of U.S. adults suffer from chronic pain and most common complaints are about headaches and back pain. Well, the simple answer is an aching sensation or pinching feeling at a particular spot or area on the body. The complicated answer provided by the International Association for the Study of Pain (IASP) is “[a]n unpleasant sensory and emotional experience associated with actual or potential tissue damage, or described in terms of such a damage”. However the accurate answer can only be given by the person in pain and we can tell when a person is in pain because of the whining, depressing faces and cries of those in pain that are made. However, what if there was a way to get rid of this pain almost immediately? Tramadol, a synthetic and centrally acting analgesic, is a FDA approved drug. So what is so special about this pain reliever compared to the other ones. Tramadol has recently been classified by the DEA as a schedule IV drug. This means it is a controlled substance. However, Tramadol has become a problem as patients are overdosing on the drug and increasing the risk of Serotonin Syndrome. This has caused a problem for those enforcing the laws and regulating medications. Serotonin Syndrome occurs because the threshold for a seizure is lowered. Tramadol works once the pill is swallowed. It is metabolized which activates high receptor affinity. The problem though is that patients are having withdrawals and irregular continuation when they take the medicine, which is a big issue. Those who have abused the substance have ruined it for those who truly need it for their chronic pain. Before it was available to patients without doctor’s approval but now because of the new classification they will need a valid prescription for Tramadol. The new classification is a step in the right direction as hopefully less people abuse medical drugs. 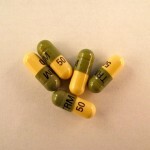 To find out more about Tramadol Controlled click here. Pregnant? Have Questions? Ask your smartphone! Urinary Incontinence: 5 Myths Unraveled.